I went birding with 2 Australian visitors (David and Jane) today. We visited Sorong ridge forest. We left Swiss-belhotel at 05.30 for the Sunbird Ridge Forest. I carried a Kinglux 20-60×60 spotting scope to watch birds that sit on the branches of distant trees. 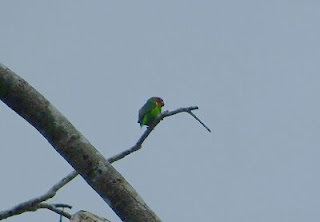 During the tour we saw Yellow-faced Myna, Oriental Dollarbird, Brahminy Kite, Grey-headed Goshawk, Orange-bellied Fruit Dove, Double-eyed Fig Parrot, Rainbow Bee-eater, Blyth's Hornbill, Red-cheeked Parrot, Black Sunbird, Olive-backed Sunbird, Black-browed Triller, Fairy Lorikeet, Double-eyed Fig Parrot, Eclectus Parrot. Although in the first one hours it rained a lot, we could enjoy the hiking and birdwing tour in the forest. We also saw Eupholus schoenherri beetle and various kinds of butterfly during the tour. Sorong city is the gate to Raja Ampat. A lot of people fly to this city every day. Most of the tourists spend one or two days in Sorong before and after their trip in Raja Ampat. They could take advantage of their stay in this city by enjoying hiking and birding. I highly recommend that visitors travel in a group of tourists to share the cost. Please, contact me (Charles Roring) by email to: peace4wp@gmail.com or send whatsapp message to my number: +6281332245180 if you are interested in taking the birding tour with me as your guide in Sorong city of West Papua province of Indonesia. 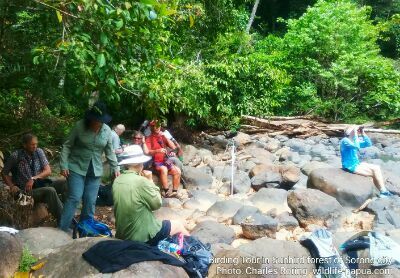 I have just completed a hiking and birding tour in Sunbird Ridge forest of Sorong regency with 8 American tourists. We left Swissbelhotel of Sorong city at 05.30 by car and began hiking at 06.00. During the tour, we were able to see various species of birds including Yellow-faced Myna (Mino dumontii), Brahminy Kite (Haliastur indus), Oriental Dollarbird (Eurystomus orientalis), Olive-crowned Sunbird, Black-Sunbird, Rainbow bee-eater, Pinon Imperial Pigeon (Ducula pinon), Singing Starling, Coconut Lorikeet. Morning time was good for birding a long the ridge because tropical birds were usually active during that period. In the afternoon, we arrived at a river in the jungle. When all the tourists enjoyed swimming, I and some local people boil water for them to make coffee and tea. Under the canopy of the trees, the temperature was quite cool. As we continued our trip to another big river, we became more exposed to sunlight. I offer tours for visitors who want to watch paradise birds in their natural habitat. The destination that I recommend is Tambrauw regency. It is approximately 2 hours ride by a 4wd car from Sorong city. To share the cost of the tour and accommodation, visitors need to go in a group of several people. Birding tour will be done along a path in the forest and along an open space such as rivers, coastal area, and at the beach. Good physical condition is needed for exploring the avifauna of Tambrauw, especially in the mountains. Every visitor needs to bring a good pair of binoculars. A spotting scope will also be good too but is not a must. The duration of the bird and wildlife tour is around 3 to 4 days where camping near a river can also be organized to increase the chance for bird watchers to see more birds and other wild animals. There is a nice birding site in Tambrauw regency that we promote to bird watchers. Its name is Fulgidus forest. We call it: Fulgidus because it is the natural habitat of New Guinea Vulturine Parrot (Psittrichas fulgidus). We offer hiking, camping and birding tour to this forest to support local people in preserving their rainforest and at the same time generating alternative income for them. When the indigenous people feel that they can get positive benefits from their forest, they will stop hunting paradise birds and other important wild animals. They will also stop logging activities that are very destructive to the environment. The duration of the birding tour can be 3 days to 1 week depending on how long visitors want to stay. During the birding tour, visitors can stay in the houses that belong to local people. However, for hiking and birding tours to the mountain and coastal area, we will build tents in the forest near a river and at the beach. We will provide tents, mattrasses, cooking and eating utensils so that visitors do not have to bring heavy equipment to this forest. All birdwatchers know that they need a good pair of binoculars. I recommend Swarovski EL 8,5×42, Swarovski SLC 10×42, Nikon Monarch 5 10×42, Canon 15×50 Image Stabilizer. If you have got a spotting scope, please, bring it too. For taking pictures, a camera with telephoto lens will be needed. You need to bring hiking boots or sport shoes with socks. Dark clothing such as dark grey or dark green or camouflage t-shirts and trousers will be very useful. After that, you could take a domestic flight that will bring you to Sorong city. I could meet you at the airport and organize your trip to Fulgidus forest of Tambrauw regency. Please, contact me (Charles Roring) by e-mail to: peace4wp@gmail.com or whatsapp: +6281332245180. I often hear the calling sound of Magnificent Riflebird (Ptiloris magnificus) when I guide tourists in lowland and lower montane forest of West Papua. The male feather is mostly dark with blue breast that looks like a triangle. We cannot easily find him. 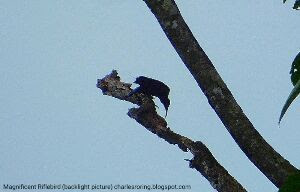 I saw the birds several times in Klabolo forest of Sorong regency. 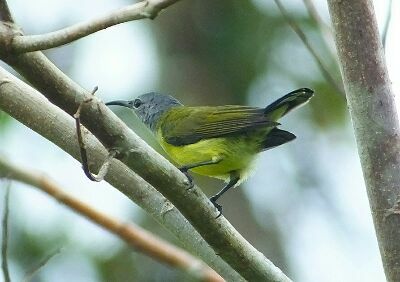 I also heard his sounds when I guide birdwatchers in Susnguakti forest in Manokwari and in Syuan forest in Tambrauw mountains. Some tourists whom I guided saw the bird through a blind which we built especially for viewing the bird in Susnguakti forest. 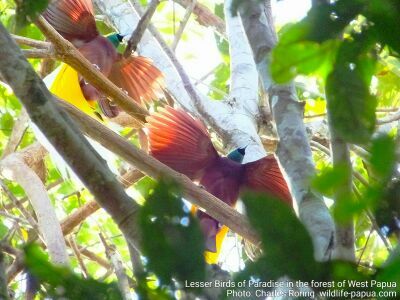 Magnificent Riflebird is not the only paradise bird that we could watch in lower montane forest of Manokwari. There are Lesser Birds of Paradise (Paradisaea minor), King Bird of Paradise (Cicinnurus regius). 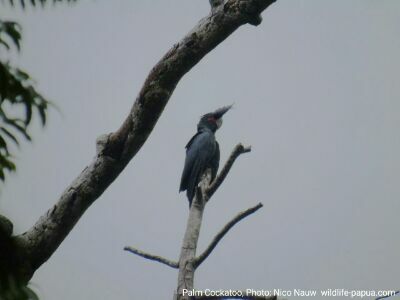 In addition to those paradise birds, visitors who explore tropical rainforest of Susnguakti could find Common Paradise Kingfisher (Tanysiptera galatea), Rufous-bellied Kookaburra (Dacelo gaudichaud), Great Cuckoo-Dove (Reinwardtoena reinwarti), Beautiful Fruit-Dove (Ptilinopus pulchellus), Hooded Butcherbird (Cracticus cassicus), Black-capped Lory (Lorius lory), Coconut Lorikeet (Trichoglossus haematodus), cassowary, and etc. Susnguakti forest is the natural habitat of insects such as: Cruiser butterfly, Silky Owl butterfly (Taenaris catops), birdwing butterfly Ornitopthera priamus, Blue Emperor butterfly (Papilio ulysses); beetles such as tiger beetle, and green jewel beetle. For marsupial animals, I have seen cuscus possum and bandicoot. There are also various kinds of reptiles including snakes, brown grown skink, Papua dragon tree lizard, small forest lizards. 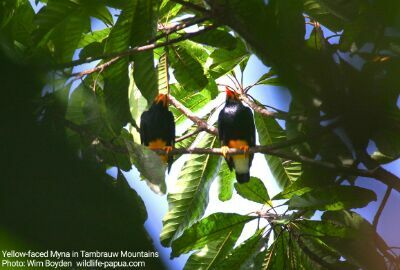 I offer a 3- day/ 2-night birding and wildlife watching tour in Susnguakti forest of Manokwari. This can be combined with tour lowland forest of Manokwari or in Raja Ampat. Please, contact me by email to: peace4wp@gmail.com and whatsapp: +6281332245180. Lesser Birds of Paradise, Magnificent Riflebird, King Bird of Paradise, Glossy Manucode, Palm Cockatoo, Sulphur Crested Cockatoo, Eclectus Parrot, Yellow-capped Pygmy Parrot, Large Fig Parrot, Red-cheeked Parrot, Black-capped Lory, Coconut Lorikeet, Boyer's Cuckooshrike, Lowland Peltop, Pinon Imperial Pigeon, Beautiful Fruit-Dove, Great Cuckoo Dove, Wompoo Fruit Dove, Hooded Butcherbird, Helmetted Friarbird, Yellow-faced Myna, Golden Myna, Yellow-billed Kingfisher, Red-breasted Paradise Kingfisher, Azure Kingfisher, Common Paradise Kingfisher, Forest Kingfisher, Rufous-bellied Kookaburra, Red-necked Phalarope (migrant bird polar region), Nankeen Night Heron (migrant from Asia), Oriental Dollarbird, Moustached Treeswift, Papuan Blyth's Hornbill, Variable Goshawk, Grey-headed Goshawk, Brahminy Kite, Northern Cassowary. Other Wild Animals in Tambrauw regency: wild boar, Deer, Soa-soa Lizard, snakes, cuscus possum, large ground skink, bandicoot, fruit bat and etc. If you are interested in joining birding tour with us, you can take an international flight from your country to Jakarta (the capital of Indonesia). After that you could continue your trip to Sorong city or Manokwari city by taking domestic flight. I will meet you in Sorong city or Manokwari city and organize your trip to Tambrauw. Please, contact me (Charles Roring) by e-mail to: peace4wp@gmail.com or by whatsapp: +6281332245180.